There was once a time when almost every home had a sewing machine and there was always someone in the family that knew how to use it. Previous generations would sew their own scarves, socks, blankets, and clothing using machines like the very popular Singer sewing machines. Sadly, sewing has mostly become a thing of the past and sewing machines are now relics more than regularly used equipment. You are most likely to find a sewing machine these days either collecting dust in the attic or basement of a home, or in the corner of a second-hand store. Many of these older sewing machines, especially the ones attached to wooden cabinets, have sustained damage from years of neglect. 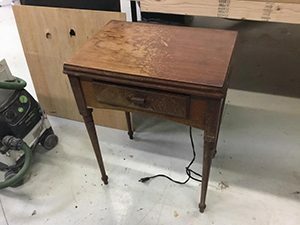 Recently, a customer brought an old Singer sewing machine in a wooden cabinet to Furniture Medic by MasterCare Experts that was in need of restoration and refinishing. This sewing machine had been sitting in the basement for years and the wood had sustained significant water damage over time. 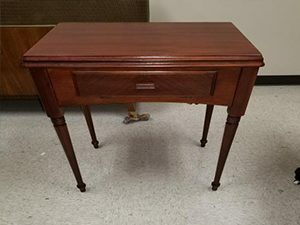 The customer who brought in the sewing machine wanted the piece to be restored with a nice, long lasting finish so she can use it to show her grandchildren how to sew. Our craftsmen were tasked with not only restoring the wood of the cabinet, but also making sure that the cabinet parts were functional and stable enough to support the sewing machine itself. We took the job knowing that we could restore and repair the cabinet if necessary to have this sewing machine working and looking good again. When the Singer sewing machine came to us, about half of the surface of the wooden cabinet was affected by water damage. The finish had worn off in the most heavily affected areas and the wood was discolored. Restoring the finish of the cabinet was the main objective, but we also had to ensure that the cabinet was functional and stable so that the sewing machine could be used safely. Our craftsmen were prepared to provide repair services to ensure that all of the parts worked. When a piece of furniture is damaged by a natural disaster involving water, fire or mold, we cover the damage with our disaster furniture restoration services. In this case we were dealing with water damage, even if the water damage was caused gradually over time and not necessarily from one specific disaster. Water and moisture is very damaging to wooden furniture because it can discolor and separate the finish, leaving the wood open to direct contact with the water. Wood is a porous material and it experiences several types of damage including swelling, splitting, warping, and cracking as it absorbs more water. The first thing we must check when dealing with water damaged furniture is if the water caused damage to the wood itself underneath the finish. In the before picture, it is clear that much of the finish of the cabinet had been affected by water damage. Fortunately, the wood itself sustained minimal water damage so we were able to remove the old finish and apply a new finish to restore the appearance of the sewing machine cabinet. The customer brought this sewing machine to us with a request to give it a new finish that will make it look nice and last for years. As you can see in the before and after pictures, we matched the new finish very closely to the original finish to help restore its appearance. Furniture Medic by MasterCare Experts has a wide range of finish colors and wood stains available which allows us to provide accurate color matching to help restore the finish of wooden furniture to look like it did originally. 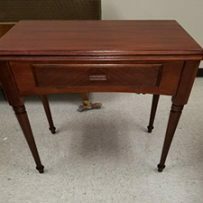 We used a wood stain and finish that most closely resembles the original appearance of this sewing machine. At the customer’s request, the new finish had to be long lasting as well as visually appealing. At Furniture Medic by MasterCare Experts, we use water-based products to provide a tough, long lasting finish for wooden furniture. We first had to put the cabinet through a deluxing process to take care of any surface blemishes and restore the original luster of the wood. We then applied the new factory finish that will preserve the appearance of the piece for years to come. 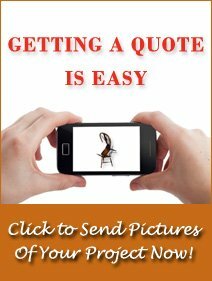 Our experts at Furniture Medic by MasterCare Experts are not only highly skilled with furniture refinishing and restoration, but also in making necessary furniture repairs. The customer wanted this sewing machine to be functional so she could share the art of sewing with her grandchildren. We checked all the working parts of the cabinet to make sure that they were functional and strong enough to support the sewing machine while it was in use. When we returned the sewing machine to the customer, we were confident that it looked much better and that it was ready to be used safely. The expert craftsmen of Furniture Medic by MasterCare Experts are passionate about restoring old furniture, especially when the furniture restoration is part of passing down a family tradition, like sewing, to the younger generation. 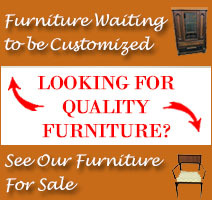 If you have a piece of furniture that has significance to you or your family that has fallen into disrepair, bring it to our professionals for furniture restoration and repair. We can provide repair services to fix broken parts and surface damage and we can offer color matching to get the right color for the finish. Give us a call at (630) 653-3131 or submit your project through our website to start the process.